Your existing customers are the lifeblood of your business. They drive profitability and provide the stability to you need to aggressively invest in acquiring new customers. Studies show that approximately two-thirds of a small business’ overall revenue comes from existing customers. It’s really pretty simple. If you’re not marketing to retain and grow your relationship with your existing customers, you’re missing out on significant revenue. Promio integrates with your POS, CRM and/or accounting system to monitor the buying behavior of all your customers. That allows our rMax Customer Retention Engine to automatically send exactly the right message at exactly the right time to every customer. For example, if Customer A hasn’t purchased for awhile, Promio can send him or her a note with a special offer if they come back in. If Customer B is purchasing regularly, Promio can send him or her a thank you note with no special offer since their behavior indicates they don’t need one to buy. The best part is that it all happens automatically, freeing up your time to work on other areas of your business. 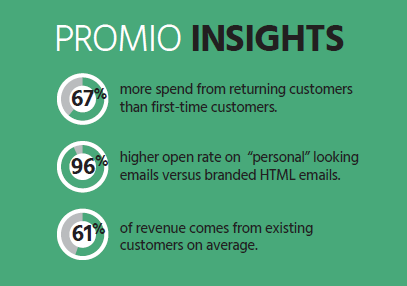 Triggered customer campaigns leveraging email and mail. Multiple customer definitions to insure each customer receives exactly the right message at exactly the right time. Easy-to-use dashboard allows you to see all of your customers and exactly what marketing they receive. Revenue reporting shows you exactly how much revenue is generated from your marketing overall and from each individual customer. Manage one simple system for all of your marketing. Maximize and measure the lifetime value of each customer. Increase your business’ revenue and profitability.